To view a particular appliance purchasing guide, please click on one of the links below. Download a PDF of our Appliance Purchasing Guide. Since 1954, Famous Tate has been serving the Tampa Bay Area with a wide variety of major appliances. Let our highly trained and experienced sales staff provide the information you need when choosing your appliances. From laundry day to dinner time, Famous Tate will work diligently to help you find products that are designed to fit your lifestyle. Every item we sell is backed by our Unbeatable 30 Day Low Price Guarantee which ensures you will never pay too much! Your dreams can become reality at Famous Tate, where we proudly carry the brands that define style and luxury. Sub-Zero, Viking, Thermador, Monogram, Dacor, KitchenAid and Wolf manufacture products that are featured everyday in designer magazines and publications. When it's time for that new household major appliance, let one of our Famous Tate sales associates help you find just the one you need! Use our informative Purchasing Guide above to better understand the appliance you seek. 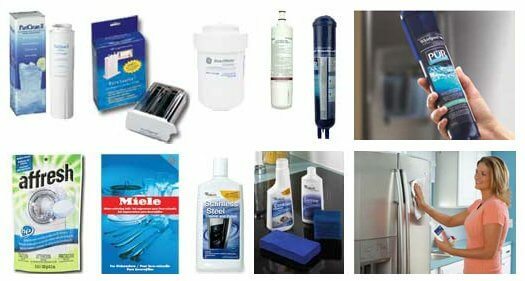 Remember to change your refrigerator filter every 6 months to ensure fresh, clean tasting water and ice. We have your replacement filter in stock at the guaranteed lowest price, plus plenty of specialized cleaners to keep your appliances looking great. At Famous Tate Appliance and Bedding Centers, we understand that purchasing appliances can be a bit confusing with all the options available at our showrooms. With that, we want to make sure our customers are as educated as possible with respect to the ins and outs of all the appliances we sell in our showrooms. We have provided this online purchasing guide for your consideration. Simply choose the appliance you are looking to lean about and view the information provided.